Whether you own a scooter or a Vespa, you can identify with that giddy feeling you get when you maneuver through the worst traffic jams in your city. In fact, most people get scooters for this single purpose along with the perks of saving money on gas. Originally invented to cut transport costs in war-time Europe, the scooter has stood the test of time as a fast, convenient and affordable way to get around. 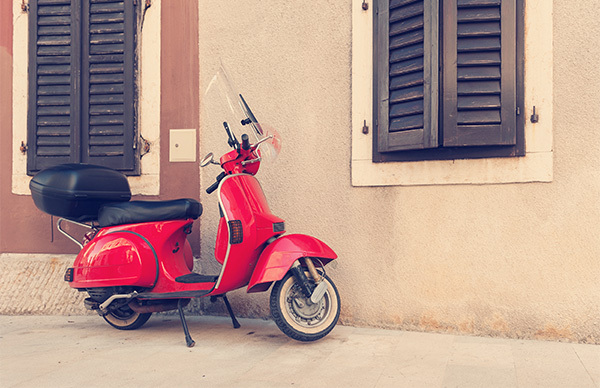 The designs seen today originated in Italy after the Second World War and have evolved as the scooter spread around the world and technology added more features to it. However, like any other motorcycle, scooters pose various risks to their users. Motorcycles in general are considered to be higher risk machines than cars due to their structure and power. While scooters generally don’t have high performance engines, they still pose other risks due to their design. This is why we, at D’Agostino Agency Insurance, have developed insurance policies specially designed for the modern day scooter rider. While scooting around in your scooter, you could get involved in a collision with another scooter or a car or a tree or anything really that could cause damage to your scooter. Regardless of whose fault it is, we will make sure that the damages to your scooter are taken care of effectively. This is something overlooked by some insurance providers but not D’Agostino Agency Insurance . We know that your safety gear such as helmet and goggles can also get damaged in an accident, so we take care of that for you as well. If you are at fault in an accident, we will make sure that you are protected using this cover. We will take care of damage to property as well as injuries caused as a result of your accident. This makes sure that you are taken care of in case of an accident where the third party has inadequate insurance or no insurance cover at all. Sometimes scooter accidents can result in some bodily injury that may require medical attention. With this policy, we make sure that your injuries are taken care of and the costs covered completely. Sometimes unexpected events happen that damage your scooter. It could be a fire, floods, vandalism or even theft. We take care of that too with this out-of-the-ordinary cover and make sure you are back on the road as soon as possible. We place the power in your hands by allowing you to choose the limits you want on any of these policies or a combination of policies. In addition, we reward safe drivers with discounts on the premium, waivers for your first accident and additional coverage at unbeatable rates. Just make sure you have a good history, a DOT-approved helmet and an approved vehicle recovery system and we’re in business! So call us today and get the most affordable, quality insurance for your scooter from the best companies.